Click here to return to emails received so far this year. Our greenhouse arrived this week and is up and running and looks absolutely fantastic. Fantastic green house, all assembled. However I have used some end caps J3-1 where I should not have done. To avoid dismantling could you please send me 10 end caps J3-1. I will gladly pay for these & postage. EXTRA NOTE:- END CAPS WERE POSTED FREE OF CHARGE ON 8th NOVEMBER. just bought one of your greenhouses, it arrived on Monday as requested and now stands proudly in my garden,the only thing slightly disappointed by was the lack of the door runner support arm however really pleased by the quality !! took six hours from start to finish! nuts bolts some sheared but will certainly recommend your products. 30 yrs ago I worked for a company now called Hall's in Paddock Wood in Kent , Yours is superior in price and quality of theirs today. Thank you !! Thank you for the prompt delivery of the greenhouse. The high level of customer service was very pleasing. we recently purchased one of your summerhouses and are extremely pleased with it. We have painted it a lovely country cream by cuprinol and it looks lovely. We would like to send you photographs and are sure you would sell even more if people could see it in this colour. If you would consider paying a fee we would gladly send you copies, it really does look lovely especially with the crazy pave step up to it. Thank you for a very pleasant and efficient service. just a line to say thank you for the excellent service on my greenhouse purchase. it is rare these days. Hi to whom it may concern. For the record, superb product looks great, fantastic value, my wife's over the moon as the greenhouse was for her Birthday present. my greenhouse was delivered today as promised, the package consisted of 2 long boxes and one almost larger sq box so 3 in all. I assume that is the total consignment. I am just letting you know this as I probably won't be opening packs for a wk or two. thanks again for your very prompt and excellent service. I have now received all parts for the greenhouse. Thankyou for your good service. We recently bought a 8' x 8' Corner Summerhouse from you and wanted to let you know how delighted we are with the kit. 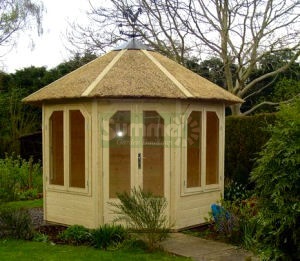 We feel that the summerhouse is excellent value for money and we are particularly impressed with the quality of the finish for a summerhouse in this price bracket. We would have no hesitation in recommending you to anyone in our area. Now almost complete, the summerhouse has been admired by our neighbours on all sides. We have only to add the door latch/handle now but unfortunately we have lost the appropriate page of the instructions! I would be very grateful if you could either e-mail us the relelvant part of the instructions or even send us a photocopy by post just to allow us to complete the latch assembly? Please find attached instructions. If you cannot open the pdf file please let me know and I will post them. Many thanks for your prompt response to my e-mail and the pdf for the instructions. I managed to open the pdf and the text is fine but for unfortunately the illustrations didn't come through. I would be very grateful if you could post me a copy? EXTRA NOTE:- INSTRUCTIONS WERE POSTED ON 18th MAY. Just a line to say that the shed which I ordered from you was delivered and erected, without any hassle on Monday - earlier than expected. I have been very impressed by the service, both on line and on the phone from yourselves and from the manufacturers. Oh, and it's a beautiful little potting shed which is already full of seeds. Many thanks. Thanks very much for EXCELLENT service-greenhouse has been delivered on a Saturday morning less than 24hrs after I placed my order! Will recommend you to all my friends and family! Good afternoon, I'm just sending a quick email to let you know that the greenhouse and extras arrived safely on Friday the 23rd of April. They are all now up and installed and I am very pleased with the quality of the greenhouse, it is excellent value for money. Thanks for the speedy and efficient service. The greenhouse was erected without any difficulties and is now already full and looks superb - I should have ordered a bigger one. However, I appear to have lost some of the stopends which came with the rainwater collection accessory kit. Is it possible to order another set - £15 plus postage. EXTRA NOTE:- AS PART OF OUR SERVICE, ANY CUSTOMER WHO PURCHASES A BUILDING FROM US CAN ADD ACCESSORIES LATER EVEN IF THE ACCESSORY IS NOT NORMALLY SOLD SEPARATELY. As requested I have attached a photograph of our new Summerhouse. I am very pleased with it and plan to move in tomorrow!! The only down side is the broken glass on one of the windows. EXTRA NOTE:- THE INSTALLER REPLACED THE BROKEN PANE OF GLASS ON 26th APRIL. thank you for the recent delivery of our corner summer house. we are very impressed with your efficient service. we have now almost finished assembly of the summer house but are not sure where or how to attach the turn buttons on the doors. can you give us any advice. many thanks. EXTRA NOTE:- ADVICE WAS GIVEN BY PHONE ON 9th APRIL. Just had our 8x8 corner summerhouse delivered today, no problems looks good quality, but unfortunately the bag containing the instructions was ripped and the instructions have got wet!. Do you have an electronic version you can send via email? EXTRA NOTE: INSTRUCTIONS WERE SENT BY EMAIL ON 31st MARCH. Just a quick email to say how pleased we are with the green house that we brought from you last week. We found the delivery brilliant and had it up in no time. we also think it was a real bargain. Thank you again and we will highly recomend you to family and friends. I have purchased one of your greenhouses with an auto roof vent. Having no problem erecting the greenhouse from your instructions i unfortunatly can not find the instructions for the auto vent. We are sales staff only on Sunday but hopefully I am able to answer your query. The automatic vent openers are normally adjustable. There are many types but for most the long cylinder can normally be "twizzled" round, one way to make it open more easily, the other way to make it open less. I hope I've answered your query but if not please phone our helpline. Lines are open from 9-5 on Monday-Friday. Thanks thats great, and we like the word "twizzled"!! EXTRA NOTE:- 2 WINDOW BOXES WERE DISPATCHED ON MONDAY 22nd FEBRUARY. EXTRA NOTE:- UNFORTUNATELY THERE ARE NO BENCHES AVAILABLE TO FIT THIS GAZEBO.